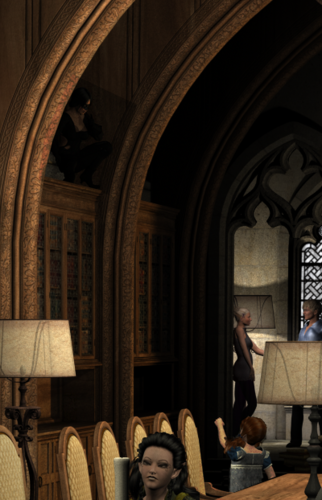 The Wizards Library - A Multi Figure Scene - Now complete! According to those who know me best, I am a bookworm of the highest order, so I was ecstatic when Jack Tomalin released The Library. It may have taken close to two years for this to be completed, but it is now done. You can see the finished version below or see the larger version here. I've been waiting on this!! Thank you! :-) It's so incredibly good to have this back up again! I recently went to put the base scene onto a canvas to see what it would look like, and discovered that the final resolution isn't high enough, so I'll be re-rendering at a higher res and (hopefully) adjusting a few minor things along the way. Will post notices and updates when I have them. Going to be one awesome scene with the higher resolution. Looking great already and am waiting to see the new figures added. O, these are very nice. Very whimsical. I like them. Well done. ...beautifully done. I love the little fey tending to the light. I look forward to seeing this progress! Apologies for taking so long, between doing my first ever thesis and work and home, I haven't had much time at all for Daz. :ohh: Horrifying thought, really. :-) The little time I've had was spent trying to up the resolution of the renders, with no luck as of yet. I really need to update my computer for it to be seamless, so until I figure a work around, will keep plodding on. gingercakes47, thank you. I've had a few difficulties with getting it into hires, but still have a few ideas to try out before giving up. Kyoto Kid, thanks :) They were fun to do. I believe I may have lightened them somewhat in the next all-in scene to make them stand out slightly more. Halcion, it is great to work with, isn't it? The lighting was a real learning curve when I set it up, but the props are so beautifully detailed. I love the detail on the pillars. Figures twenty and twenty one. Woe betide the one who through carelessness drops a book at the feet of a book lover. Figure 22 - Browsing for a book. ...nice to see this still in production. ...interesting all the ebots for threads I've been subscribed to and have been on more recently have broken and now I get one for a thread I haven;t been involved with for over a month. Daz,, fix the bloody forums. Thanks Kyoto, I'm not giving up on this one, uni's had me so busy lately that I've finally said 'enough!' and taken a few days out to render. This unit finishes in two weeks though, so may have a bit more time to render, depending on the workload of the next unit. I'll match your doughnuts and add in every Dazzites favorite drink too! What Kyoto said.. and.. Whiskey! ...small batch single row, of course. Your library is looking really great...............how many more are you going to add? Figures 23 and 24 - A thief of knowledge - but she's been spotted! Two things - I've started on the 'painting' that will replace the mirror in the background. I've started adding figures into that, would you be interested in seeing it's progress as well? It's not ready to share yet, but when it's time, I can post the renders for that one too. There'll be between 10 and 20 figures within that scene. Secondly, is it time to post another full scene shot? Figures 25 and 26 are rendering away at the moment, and after reaching the quarter of a century mark, I was thinking of posting the full scene again, with all 26 figures in it. What do you think?